Want to Learn How to Restore and Maintain Bone Health? 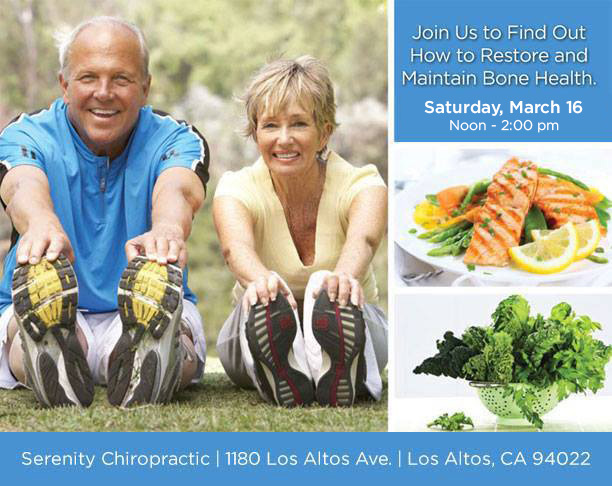 Join us to discuss how to keep strong, healthy bones. We will discuss lifestyle choices that have a direct effect on bone health. These include diet, exercise, and nutritional supplements. If you have results from your DEXA Scan we can discuss your results privately. I’ve seen thousands of patients in my chiropractic practice over the last 30 years, all with one thing in common — they all want to feel healthier and happier. Based on seeing what worked for my patients, I’ve identified the essential keys that work together to create a feeling of well-being. I call them The Seven Pillars of Serenity. Now, I’ve created a comprehensive program that anyone can follow to start feeling better now! If you’re ready to take some time to slow down, focus your attention,and take some simple steps, you can achieve a sense of well-being unlike anything you’ve ever known.